"I Am Bane": Part 2 - "Day Two"
Superman flies to the Fortress of Solitude. Batman is already inside. Batman asks Superman if he could leave Nightwing, Redhood and Robin in his care at the Fortress to keep them safe from Bane. Back in Gotham, Alfred sneaks the Psycho Pirate into the holding cell of Gotham Girl, to undo the damage he did to her psyche. Commissioner Gordon is attacked by Bane's henchman, with Batwing arriving to help. 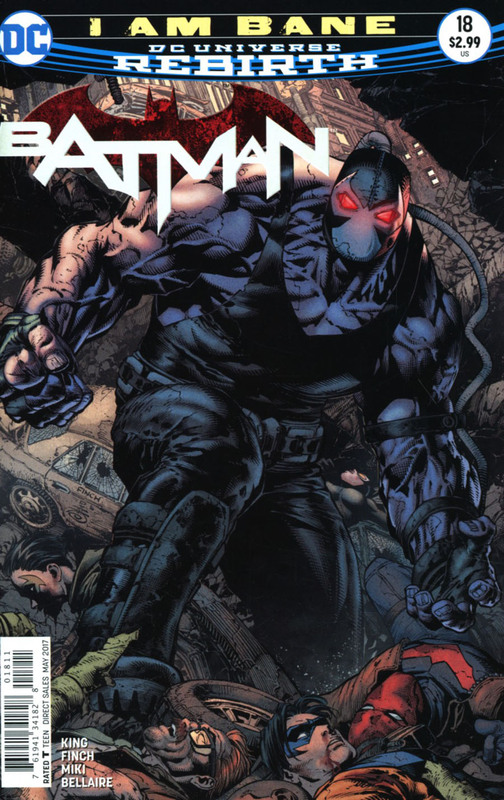 Bane takes down the rest of Batman allies and calls him out. Story - 3: I like what Tom King has done with the title so far. It's not perfect, but it's been an entertaining read. With that said, there is NO WAY that Batman can get into the Fortress of Solitude without Superman... Ever! I know he is considered as the best on the planet at anything, but I'm sorry, batman can't get into the Fortress undetected, let alone dragging three bodies in stasis chambers with him. While we are on the subject of the Fortress, it seems that this Fortress is meant to have the same key as the one Superman had in All Star Superman. It worked in that story, I just don't think it fits in too well with this universe. And if that key is meant to be as heavy as the one in All Star Superman, there is no way in hell that Batman is getting into the Fortress by himself! The reason I didn't score this lower than a 3 is, like I mentioned before, Tom King has done a decent job with the title so far, and even though I may not like some of the characterizations, it's not a bad read. Art - 5: I had always liked Finch's art. He has a really dark and moody style, with a lot of grittiness to boot. He had always seemed like a perfect fit for Batman. Though he has worked on the title on and off for a few years now, I'm glad to see him back on the character. His Superman has always been a little hit or miss for me, as I find that Finch struggles with the face every so often. He did ok with him this issue, though he was mainly in shadow. I'm also not sure whether it was Tom King or Finch himself that added in the All Star Superman key to the Fortress, though it doesn't really fit in this universe, Finch did a good rendition of it. I'm really glad he has gone back to simply pencilling, as his work on Forever Evil wasn't the best. With that, I must acknowledge Danny Miki's awesome inks. He makes for a great team with Finch, and is one of my more preferred inkers for him. Jordie Bellaire provided the colors. They have a muted feel to them, reminiscent of the live action films, but the one thing I loved the most, even though it was an error, was the fact Bellaire gave Superman his red boots back. Cover Art - 4: I like the main cover by Finch more than the variant by Tim Sale. I just don't think Tim Sale's style is a good fit for this new batman costume look. Though very similar to how he usually renders it, just doesn't look right.